For years, like most silhouette artists, I tended to avoid these questions. This is true. My fellow American silhouettists refer to such cuttings, rather disparagingly, as “lollipops”. For people with long hair, covering their ears and neck, the prospect is even more uncertain. One may as well cut out a sack of potatoes! 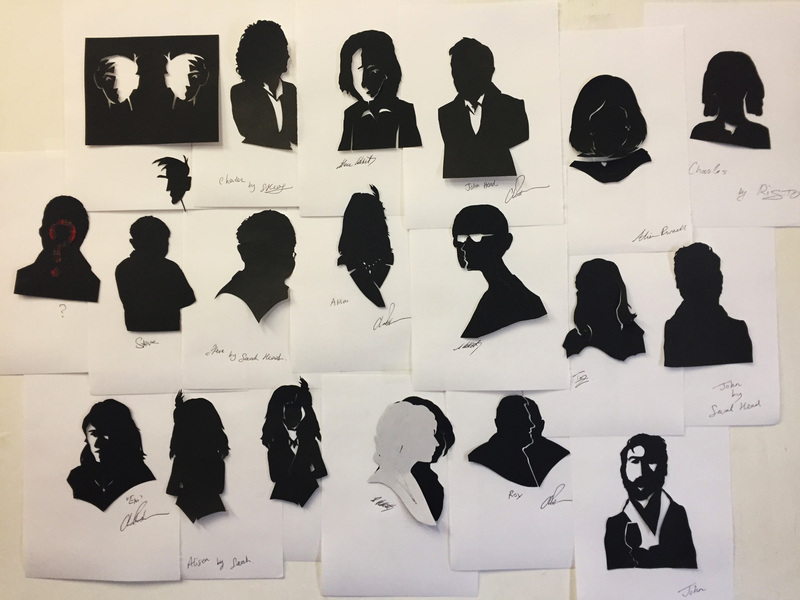 Generations of silhouette artists have always cut their portraits in profile. Looking through my collection of antique silhouettes, I’ve never seen one not in profile. To a silhouettist, this feels “just the way things are”. There’s something about the human profile which allows us to bring out the likeness; nothing else really works. Could I work not in profile? Working at events offers me some wonderful freedoms. You may have heard me say that my studio is wherever I happen to be that day. I’m fond of saying it! You see, when a question like this pops us, I’m free to experiment. Nobody really minds if one or two silhouettes go wrong, it just becomes part of the fun. So, one Christmas season, I decided that next time somebody asked “what happens if you cut me face on?” I would give it a go. As predicted, I quickly ran into problems. Graphic designers have time on their side. They can draw out their designs and spend time refining and correcting them. I literally just cut and hope! My most successful cuttings were bald men with white shirts. By cutting in the collar and tie I discovered I could create the shape of the head, and — yes, to my surprise — there was a likeness there. Attractive young women with long hair, on the other hand, really did come out like a sack of potatoes! I decided to put the project on the back burner. 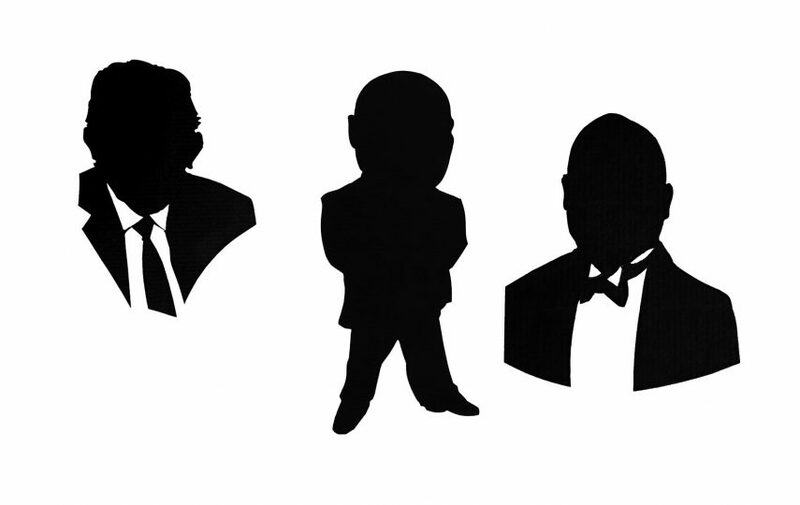 Freehand head-on silhouettes cut at a variety of corporate Christmas parties in 2016. Last October I was booked to create reportage silhouettes during an interview in Ghent, Belgium. Reportage is when I cut silhouettes to illustrate a meeting or event — in this case for a magazine article — rather than to provide entertainment. 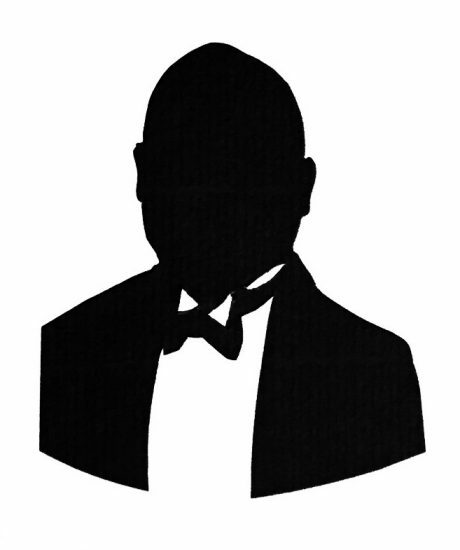 The interviewee was a famous Belgian tax inspector, well known for his black and white views on tax law (hence the silhouette theme). The interview was scheduled to last for 40 minutes. I began by creating silhouettes of both interviewer and interviewee, and then went on to create some scenes in profile. These included the table, books, and cups of coffee between them. This was quite complex and (for me) time-consuming work with a lot of detail and some preliminary sketching required. Once my work was done it became apparent that the interview was going to overrun. It occurred to me I could use the extra time to experiment with not in profile silhouettes. I created a few of these, freehand, quite fast. Sifting through the cuttings afterwards it became clear — as is so often the case — that I’d done my best work in the closing minutes of the interview. By then I was working at high speed and was not really thinking about what I was doing. I was just playing! One of these cuttings became a full-page spread in the magazine. 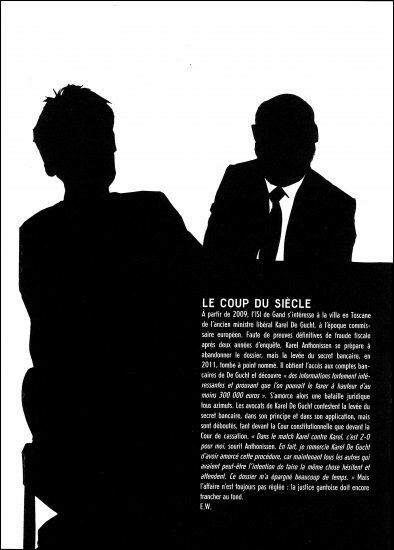 The interviewer has his back to us, while the tax collector is silhouetted face on. A large area of black paper became a backdrop for text in white. The commissioning editor was really enthusiastic about this cutting; he felt I had discovered a truly French, comic-book style! After this experience, I realised that reportage may be a way forward. Eager to explore the style further,I decided to seek the input of some other silhouettists. So, just over a week ago, I hosted a not-in-profile Burns Night party. Being a Burns, Burns Night has become a big thing in my life. Every year I invite those silhouettists I work with regularly, plus a few other artistic friends, to a dinner in Mays Barn (my studio in Emmer Green). My idea is some sort of post-xmas / Burns night / Roving-Artist company party. We don’t really follow the Burns-night protocol (apart from me getting to slice a haggis in half with a sword!) Each year, I pose to the assembled artists a different artistic question. Last week, I asked them to bring their scissors, so we could explore these not in profile profiles together. Some whisky-inspired head-on silhouettes cut at Mays Barn on Burns night. Do you have a favourite? The result was a wall of rather odd cuttings. What do you think? Do you have a favourite The most popular on the night was lower right, the gentleman with a beard and wine glass. Personally, I like the slightly cubist portrait of me (top row, 4th from right). What of the future? 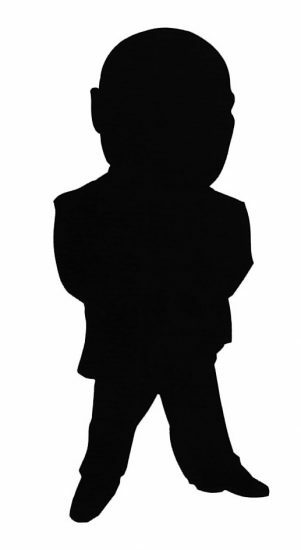 As entertainment – although it really amused a troupe of silhouettists – I’m not sure the idea works. The results are just too uncertain. As illustration or reportage, however, it certainly does. I’ll be exploring the idea further during 2018, and will post an update later on. Charles, this is superb. The full-page spread in Médor magazine is powerful. And the wall of Burns Night cuttings suggests something of the movement one associates with a group of people. An intriguing counterpoint to the static profile of a conventional silhouette. Brilliant. Surprisingly it works. Most cartoonist choose a profile or semi profile to give features (mainly nose and chin) to exaggerate. Artists will draw face on as they can show features and expression. I guess you need a distinctive head shape or ear shapes to get an effective silhouette. This idea add an extra ‘something’ to your output. I guess I shouldn’t be surprised; anything is possible. Some of you of my age might remember Peter Brough and Archi Andrews. Peter made his name performing as a ventriloquist – on the radio! Why didn’t I think of that? 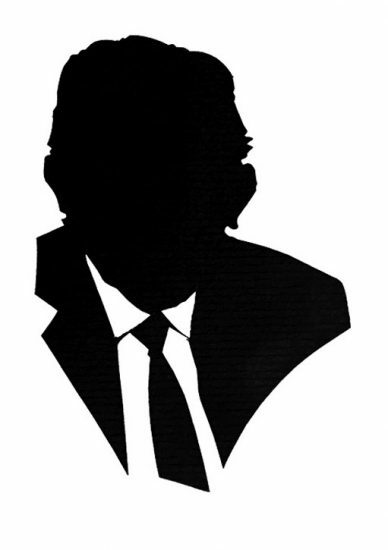 Well, BBC Berkshire is fond of asking me to cut silhouettes on the radio, which is almost as mad! I think I’ve done all their presenters by now. I’m just waiting for Radio 4 to take up the idea! Interesting alternative… I hope you’ll get some more reportage work. Just a detail – the magazine Médor is written in French, but is Belgian rather than French. 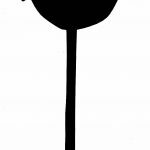 In fact, the explanation of its title “Médor n’est pas un/e chien/ne” (Médor is not a dog – he or she) makes me think of Magritte’s painting “Ceci nest pas one pipe”. II had never heard of Médor, but nice to be informed and to look at some of the articles. Makes me feel at home and I knew Magritte when I was a child, so even better! Thank you! Thank you for the explanation. My French is fairly basic I’m afraid – despite my being an art student in Lyon for one summer. That was long ago! Charles, you are a truly fascinating guy – whenever you reveal what you’ve been up to I always feel my brain being transported to places it’s never even imagined before. Thanks, as ever! I am absorbing everything I can at the moment and I must say your enthusiasm is extremely encouraging. Previous: « Can a shadow survive a fire?